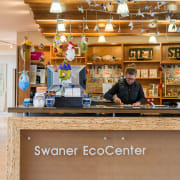 The position of the Weekend Front Desk Assistant is to support the EcoCenter staff person (the EcoHost) during the EcoCenter's busiest times on Saturday and Sunday. The Weekend Front Desk Assistant represents our organization to the public, who visit or contact the Swaner Preserve and EcoCenter. If you are interested in this volunteer opportunity or would like more information, email Rhea at rhea.cone@usu.edu. Rhea will let you know the next available volunteer shift.